Be the first to share your favorite memory, photo or story of Donald "Don". This memorial page is dedicated for family, friends and future generations to celebrate the life of their loved one. 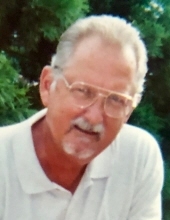 Donald “Don” Roy Turner, age 75 of Carrollton, Georgia, passed away on Friday morning, April 5, 2019. He was born November 10, 1943 in Charleston, West Virginia, the son of the late Harold B. Turner and the late Ruby Becker Turner. He graduated from St. Johns River Junior College Vikings and was in the 1967 National Basketball Championship Tournament. He attended the University of Alabama and graduated from the University of West Georgia, where he lettered in basketball, with a degree in Business Administration. He was retired from Southwire with thirty-one years of service. He was a veteran having served in the United States Marine Corps and was a member of Tabernacle Baptist Church. Survivors include his wife, Debra Pedigo Turner; son, Baker Turner; daughter-in-law, Katie Turner; daughter, Lindy Turner; brother, Harold Bud “Buddy” Turner; and two grandchildren: Gavin Turner and Eli Turner. In keeping with the family’s wishes cremation will take place prior to the service. A Celebration of Life Memorial Service will be conducted Wednesday, April 10, 2019 at 2:00 PM from Tabernacle Baptist Church with Dr. Stephen Allen officiating. Inurnment will follow in Carroll Memory Gardens. Messages of condolence may be sent to the family at www.martin-hightower.com. Martin & Hightower Heritage Chapel has charge of the arrangements. To send flowers or a remembrance gift to the family of Donald "Don" Roy Turner, please visit our Tribute Store. "Email Address" would like to share the life celebration of Donald "Don" Roy Turner. Click on the "link" to go to share a favorite memory or leave a condolence message for the family.